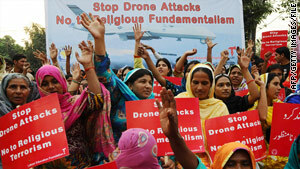 Pakistanis protest drone attacks and religious fundamentalism last week in Lahore, Pakistan. Islamabad, Pakistan (CNN) -- Two suspected drone strikes in Pakistan's tribal region Wednesday killed eight suspected militants, intelligence officials said. In the first incident, one missile was fired on a militant hideout in the area of Mir Ali of North Waziristan, one of the seven districts of Pakistan's tribal region bordering Afghanistan, the two intelligence officials said. Five were killed. Later, a second suspected U.S. drone strike killed three individuals believed to be militants, the officials said. The drone fired two missiles at a vehicle in the Data Khel area of North Waziristan. According to a CNN count, Wednesdays strikes were the 81st and 82nd this year, compared with 52 in 2009. The officials asked to not be named because they were not authorized to talk to the media. While the United States is the only country in the region known to have the ability to launch missiles from drones -- which are controlled remotely -- U.S. officials usually do not comment on suspected drone strikes.